As humans we are experts at reading each other faces. We train all of our lives to read the subtle shifts that cross a face and communicate deep messages. You only have to look into a friend's eyes to know that they are happy or sad, troubled or light. 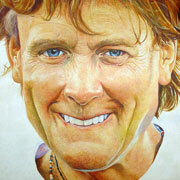 That is the start, the beginning of the training that is required to paint a portrait. The ability to capture the fleeting shift that crosses the sitter's face and mind is paramount, without which the image would be simple pigment and cloth. Like Annigoni, Sergeant or Ingres before us, all we have is the paint and our eyes to reach out and touch the viewer, to reveal to them the person that is before them. The communication is complicated and multi-dimensional. 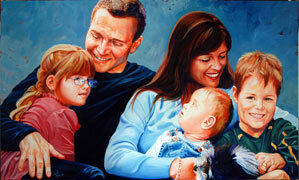 It is a communication between the sitter and the painter, the painter and the canvas. This dialogue lasts until the canvas is complete however there is another dialogue and in this is the success or ultimate failure of the portrait. It is what the canvas says to the viewer. The stronger the portrait the more the viewer sees, hears and feels. Of course as the viewer changes so does the dialogue, each taking something different from the experience. Honed skills, compassion for the sitter, an openness of spirit and a willingness to reach inside oneself to touch the humanity and place a small portion of it on the canvas, are essential to paint a lasting and successful portrait.